Your reporter has done close to thirty Round the Islands and 2016 has to be one of the windiest yet. 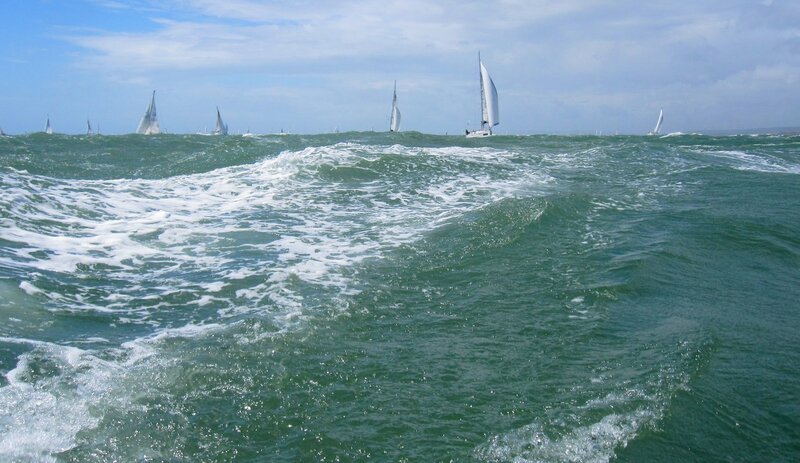 After starting with full main and genny we were soon seeing 30 knots true wind off Yarmouth and again around the back of the Island past Ventnor peaking on a couple of occasions at 38. The kite stayed in its bag but we bowled along at a cracking pace goosewinging slightly by the lee with a boom preventor giving a stable ride. As ever PYRA boats showed up well in the results – Ruthless and Minstral each winning their classes, the latter also winning the ISC Arun Trophy team prize together with Mojito and Fraid S’Eau, each of whom got seconds in class. A quick scan of other single figure results show PYRA boats Flair IV 3rd in class, Shebeen 4th in class, Quadrophenia 5th in class and Panache 8th in class. Well done to all of them. On the down side, at least 3 PYRA boats (Maris Otter, Matchmaker and Zorra 2) retired with breakages, 2 of them within a mile or so of the finish. It was a tough race. The PYRA feeder race from Poole on Friday, generously sponsored by Tapper Funeral Services and started by Firestarter with a quick windward hitch to East Hook, set off sedately enough with kites flying across the fleet. The breeze gradually built from the west so by North Head most had reverted to white (well a mix of grey and black) sails for the harden up to Hurst where the tide was ebbing strongly kicking up plenty of white water. Your reporter had a good view from the class 3 end of the fleet seeing Mojito screeching round to windward, allegedly mimicking Firestarter’s similar frantic antics a few minutes earlier. I’m not sure if we were the only boat to hold our kite through Hurst hurtling across the back of Zorra in a cloud of spray, but we were wide eyed with terror as they watched open mouthed in astonishment with cameras ready for the ultimate wipeout. It didn’t come but we didn’t dare gybe so carried on against the tide down the rhumb line to Cowes with a few broaches en route including putting this helming reporter under water with water pouring into the cockpit. Meanwhile most sensible boats at Hurst had gybed without kites towards the mainland shore where they rehoisted but still in blustery conditions. I’m told that Mintaka on her first PYRA outing, lost her rig and retired into Lymington at this point. The mainland side choice appeared to pay off by the Medina finish line. PYRA’s intrepid Record Secretary had already sneaked into Cowes by landlubbery means to station himself invisibly by the Egypt Point Light where he took our times making for some interesting comparisons with boats’ own self recordings. Matt did the same for the Sunday return leg so be warned! Flair IV, Maris Otter, Zorra 2 and Ceres won classes 1, 2, 3 and 4 respectively. It was a very different story on Sunday when bruised and tired crews came to the Medina start line, again under the competent care of Firestarter. All classes started together into a gentle 12 knot south westerly at the start of the ebb tide. Looking for the stronger tide on the Island side generally worked well with interesting wind shifts to watch for. Through Hurst as the wind fell away, then careful working up to the windward side of the course often in less than 5 knots of wind and occasionally nothing except the tide. Towards the back of the fleet Maris Otter sneaked up her asymmetric as the forecast backing to a southerly started. Predictably the 4 class 3 boats found themselves bunched together all playing their kites in a very close and light breeze. Shebeen broke through to windward then bore away for a gybe at Bar Bouy to take class line honours from Zorra 2 close ahead of Pied Piper. Neverthess Pied Piper won class 3 on corrected time. Blue Jay, Maris Otter and Koko won classes1, 2 and 4 respectively. It was a lovely sail in bright warm conditions, challenging in a delightfully gentle way after the previous 2 day bashing. Many thanks to Steven Tapper for supporting this PYRA event over many years.